I happen to be a knitter as well as a sewist, so part of what I’m going to talk about is related to how the stitches are formed, because that helps explain the differences in the fabric. And by the way, if you want to see knit fabrics in motion, you should check out the video I’ve got in this post. 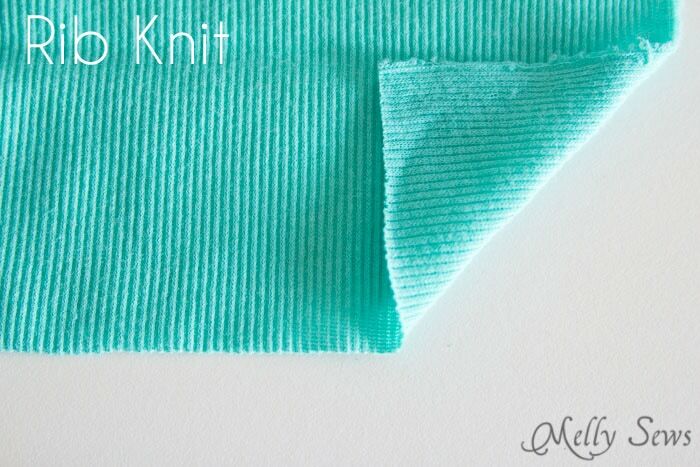 Knit fabrics are made of a combination of knit and purl stitches. The basic difference between those is whether the yarn is carried from stitch to stitch on the right or wrong side of the fabric. For knit stitches the yarn is carried on the back side. With purl stitches the yarn is carried on the front side. In the picture below, you can see the horizontal yarn carried on the wrong side of the fabric. This fabric is formed by knit stitches on the right side and purl stitches on the wrong side. 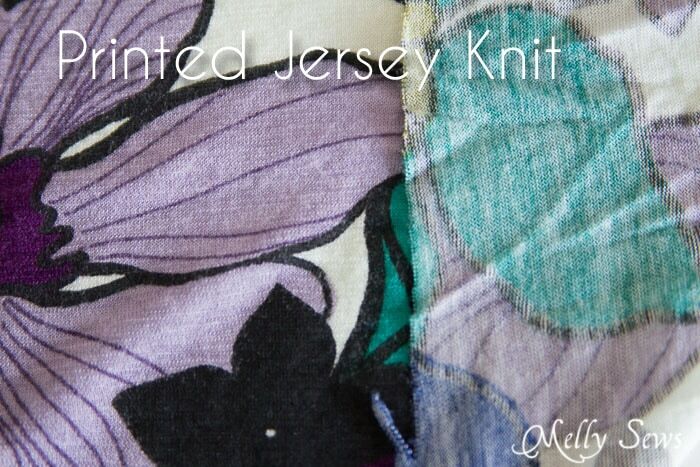 This method of knitting the right side and purling the wrong side is how jersey knit is formed. The picture above is a sweater knit, but if you look really closely, you can see the same stitch pattern in the jersey knit below. Because the thread is always carried on the wrong side of the fabric, jersey knits are not the stretchiest type of knits. Some, like the one pictured above, have spandex in them to improve stretch. Others, like sweatshirt fleece, barely stretch at all. Another property of jersey knit because of this knit right side/purled wrong side is that it tends to curl toward the right side parallel to the selvedge and toward the wrong side perpendicular to the selvedge. You can see how the fabric in my picture is curling along the cut edge. In the picture above, the jersey knit is yarn dyed gray. 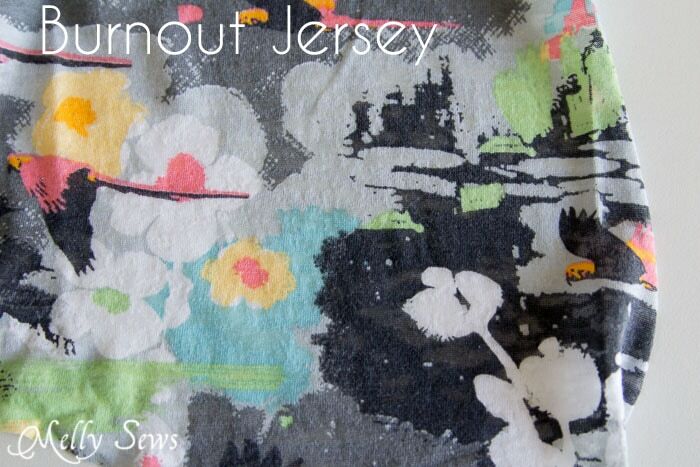 Most jersey knits with a print on them are printed on the right side, much as quilting cotton is printed. Occasionally you will find yarn dyed print jersey, which has the print on both the right and wrong sides. Sweatshirt fleece is another type of jersey knit, again knitted on the right side and purled on the wrong side. Then the wrong side of the fabric is brushed, forming that fuzzy look and feel that also makes the fabric warmer as it traps more air. 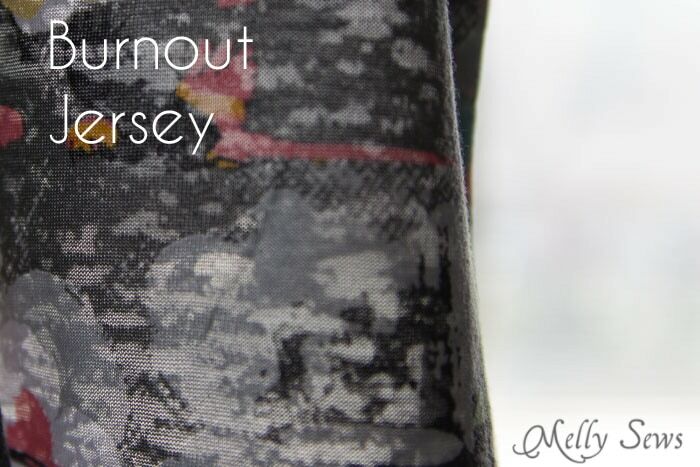 One more type of jersey is burnout jersey. This is made with yarn/thread that is a combination of cotton and synthetic fibers, usually rayon. It’s knitted/purled/printed like a regular jersey print. But then after printing, a chemical is applied to the fabric that “burns” the cotton fibers off, leaving the synthetic fibers behind, and resulting in see-through patches that you can see more clearly when the fabric is held up to the light. Interlock knit is a type of double knit fabric. Without going into super technical details, it’s kind of like two pieces of jersey knit back to back with the same thread. Because of this, it is stretchier than jersey, and it looks the same on the front and back side, as the yarn is carried in the middle between the two knit sides. This also means interlock is typically a little thicker than jersey, and that it doesn’t curl. 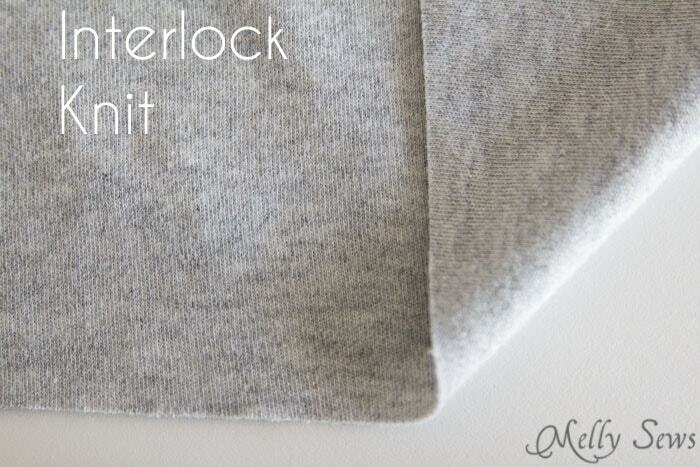 Interlock is the fabric I recommend to people who have never worked with knits before – it’s stable, usually has good stretch and recovery, and is generally the easiest knit to work with. 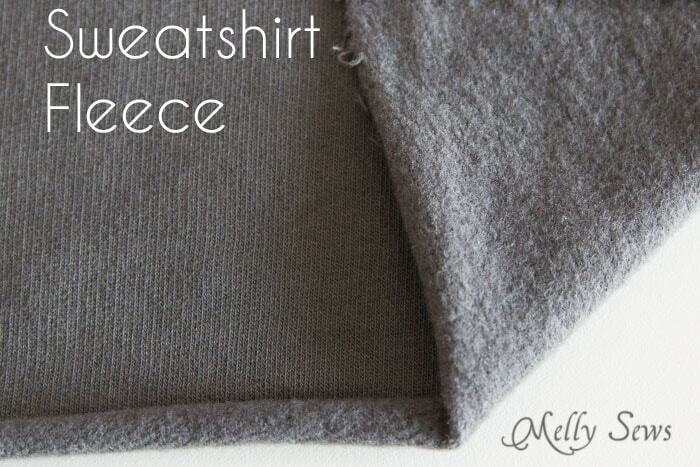 Ponte (pon-tee) or ponte de roma is a type of interlock knit, made with a blend of synthetic fibers. French Terry (not pictured) is another type of double knit, but this is made with two yarns; a smooth yarn on one side and a looped yarn on the other side. That is what gives French terry a smooth surface on one side and the looped towel like surface on the other. Rib knit alternates knit and purl stitches on the same side of the fabric, then on the other side the knit stitches get purled and the purl stitches are knitted. So for example a knit pattern for ribbing might read knit two, purl two, repeat on the right side and purl two, knit two on the wrong side. This forms the vertical ridges you can see on the fabric above. Because the yarn has to be switched from front to back so often, rib knit is also very stretchy. 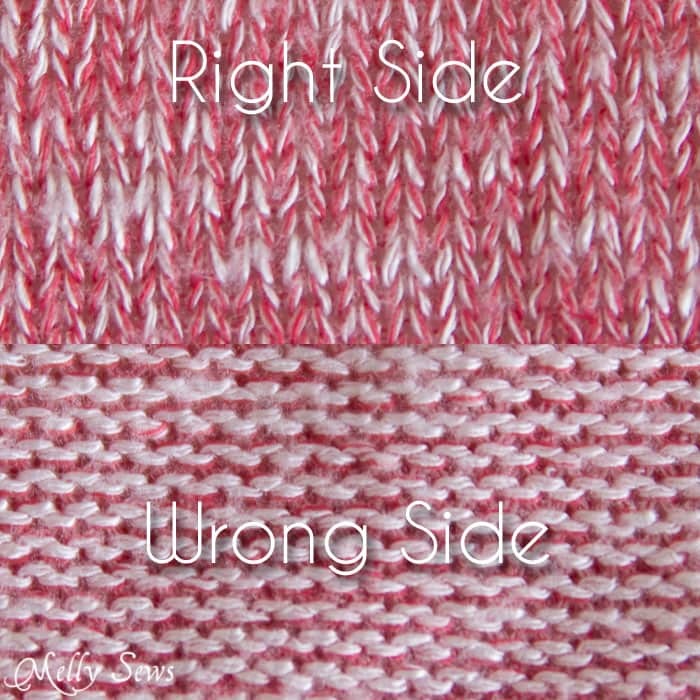 Also because of the even distribution of knit and purl stitches on the front and back side, rib knit typically looks the same on both sides and does not curl. Rib knit is great for collars and necklines, because it stretches a lot and because it adds stability to jersey knits in those areas. 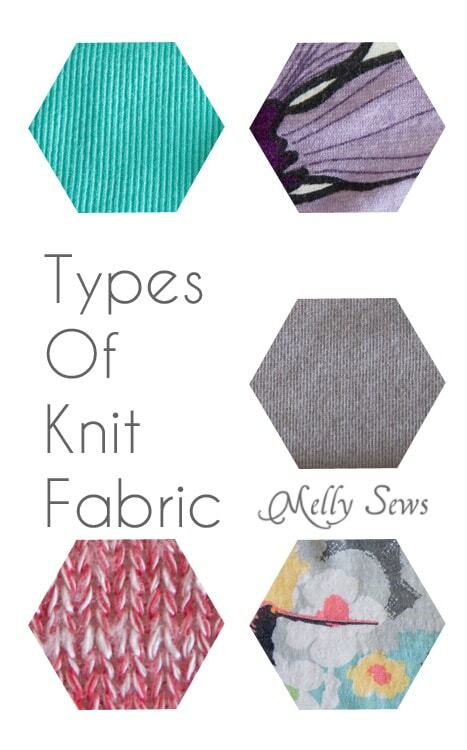 So those are the main types of knit – hope this helps you when you’re shopping! Thank you for the excellent survey of knits. I’ve wondered for ages about sweatshirt knits and french terry. I know I’ve run across other knit primers on the subject, but the knowledge only lasted a few minutes in short-term memory before evaporating out of my head. Reading this, I felt that “Ah-ha!” click. (I still have questions though: what about tricot & weft knits? What about ITY & hacci? What about velour?) I think you might’ve written one of the best introduction to knits ever. This is such great information. I really appreciate it! 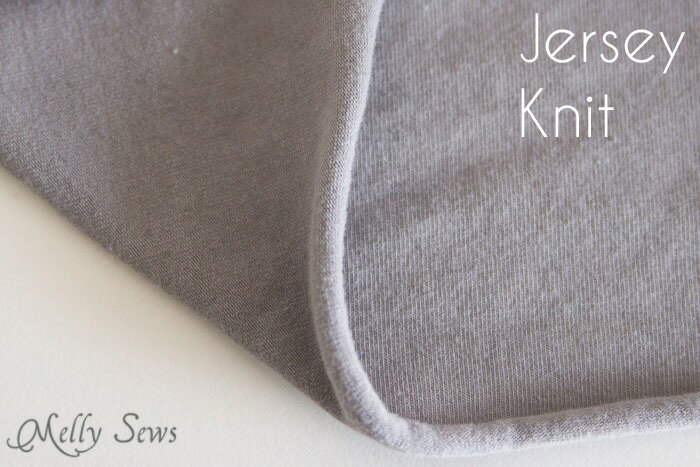 Could you answer this though, is it true that that jersey knit does not fray when it’s cut? That’s really helpful, thank you! I’m still quite new to dressmaking and don’t have any decent fabric stores close by where I can go and look at fabric and ask questions – but it’s hard to buy online when you’re a newbie as you don’t know what it is that you should be looking for! What about the knit fabric used to make hooded zipper front jackets with normally a print in the front and a double knit (looks like it anyway) in the back. The back always looks very textured while the front is smooth. I don’t know what it is called so I don’t know what to look for on online fabric stores. That’s typically printed sweatshirt fleece – like the solid above, just printed on the front side. It can also be French Terry. Excellent article! I’ve been wondering about the different types of knits and from now I’ll actually know what I’m buying. I’m starting to sew with knits and was totally confused with the terminology. What a great article! I’ve been in the dark for a long time on those darn knits…counting on end of bolt for type and information. I am also a very basic knitter..knowing the basic knit and purl stitches..so this article made perfect sense. Thank you!! Thank you thank you thank you! Just theninfo I needed! !